Located in Trichy, an important educational centre in the state of Tamil Nadu, RVS KVK School of Architecture tends to meet architectural education demands and is regarded as one of the prestigious institutes in the country. With innovative teaching methodologies in architecture learning, the institute facilitates potential students who have limited options of a quality architectural education. "Since there is huge demand for qualified architects in India as well as in other countries, the young minds need to be equipped to meet the world's expectation at large. To facilitate such brighter generation with quality education and the critical necessity for a good architecture school in the region have been the key factors in establishing RVS KVK School of Architecture," says Jegan Palanichamy, Principal and Dean, RVS KVK School of Architecture, Trichy. Emerged as one of the top institutions within a brief period, this standalone architecture school was established in the year 2011 and has won many accolades and awards thereafter. "We are proud to say that we have students from all over the southern states for a truly diverse multicultural environment," claims Palanichamy. The institute invites eminent practising architects to provide constant guidance for better performance of the students. "Architecture education can be taught through romanticism or structuralism. There has always been a constant conflict between these two methodologies. KVK has devised a special curriculum, which we call 'Structural Romanticism' emphasizing both so as to strike a perfect balance between being sound in theory, and being close to reality in their design solutions," explains Palanichamy. With a strong belief in training students mind to think, students of KVK are exposed to real time construction details and contemporary advancements in the construction industry through case studies and product exhibitions and would explore experimental possibilities. Most importantly, the students are encouraged to experiment at their will. "We always insist upon students to get their practical exposure along with their scheduled theoretical subjects. 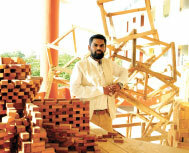 Most Design studio exercises introduced from the live government projects," pinpoints Palanichamy. KVK regards their faculties as their core strength. All the faculty members are of high calibre, many having spent minimum 15 years in teaching and practise. Being practising architects, the faculty can impart Faculty members actively involve the students in the hands on workshops on a regular basis. Thereby students are encouraged and guided properly to take part in various national as well as international competitions and instil a sense of inquisitiveness in their learning methodology. Live Case studies are an integral part of the program, the students take up several case studies and portfolio of travel sketches. A special rural studio where students are made to stay to document different aspects of the rural setting, namely visual aspects, socioeconomic aspects, physical settings, service aspects, historical aspects and their futuristic ideas and proposals to uplift the quality of the village. Three-dimensional thinking is taught through Basic Designs, model making, anthropometry, graphics and joinery workshops in the first year. The carpentry and model making labs are equipped with state of the art equipments, which would enable the students to experiment with material research. The students are trained to make the models that they visualize. Students are exposed to software skills like AutoCAD, 3ds Max, Revit, Rhinoceros, Sketch Up and animation photo editing softwares during their later years. The Final year students are exposed to various other specialisations through elective subjects such as conservation, sustainable architecture, Housing, Interior Design, Landscape, Urban Design, Town Planning, Project Management and Architectural Journalism. It is primarily concerned with providing students highest level of knowledge, skill and competence. In order to produce professionals of high calibre, equipped with the professional skills required in the design, planning and implementation process in the construction industry, the institute works towards providing the students with practical training in the use of information technology. These trainings reflect the state-of-the-art architecture and establish a foundation for their practise in the future. KVK has taken up initiatives such as documenting the heritage monuments, which are deteriorating due to negligence. They believe that built examples are the reliable evidence of our history and so particular place's cultural richness and tradition is better carried to forthcoming generations through the built form only. "Our efforts in documenting traditional water management techniques through 'subterranean microcosm' - has received wide appreciation and funding for further research is also promised to widen the research area," adds Palanichamy. The institute's environmental awareness efforts have been well known which has attracted nationwide appreciation and acclamation for its wide publicity and reach. They have conducted their Annual event for the consecutive two years 2015 & 2016- 'Carving Cauvery' - Sand Sculpting Competition for All - is one of its first kinds to be implemented successfully in the River. Amidst a number of challenges, KVK has already achieved a number of appreciations in their six years of journey so far in providing architectural education including national awards. The institute believes that Architects graduating from India play vital role in the making of developing countries, like Singapore, UAE, Qatar etc and most of these architects hail from our country. Taking pride and addressing the acute shortage for qualified architects as an increasing concern worldwide, KVK pledges to be the knight in shining arm for the ones who dream to be successful Architects. With More than 13 years of academic experience including 3 years in administrative position as Dean heading School of Architecture, Palanichamy has spent more than 11 years designing residential, mixed use and commercial projects across UAE with leading multinational architectural consultancies. In India, He has been associated with IIT Madras, ISRO, IGCAR for many projects and designed many residential projects, low cost housing and institutional projects. He had been a member of various academic and professional committees. He has won national awards and accolades such as documentation "Subterranean Microcosm" in 'Thanima-2, Birla Yuvaratna - National award for 2016.